Trotskyist Alan Woods on the Hungarian uprising of 1919. Wood's account suffers from the usual analytical errors by Trotskyists but is included for reference to these little-known events. On March 21st, 1919, the Hungarian Soviet Republic was proclaimed. On the 1st of August, 133 days later, this heroic chapter in the history of the Hungarian working class was brought to a close with the entry of the White Rumanian army into Budapest. Had the Hungarian proletariat succeeded, the isolation of the Russian Workers' Republic would have been brought to an end. The brief experience of the Bavarian Soviet Republic which lasted from April 7th until May 1st 1919 was an indication that the flood-tide of revolution was spreading from East to West with what seemed at the time an irresistible urge. Had the Hungarian workers' state managed to consolidate itself for just a few months longer, the flames of revolution would have engulfed Vienna and Berlin, where the working class was already in a state of revolutionary ferment. The triumph of the German revolution would have changed the whole course of human history. Yet this did not take place, and the Hungarian Revolution of 1919 entered the annals of history as yet another heroic episode like the Paris Commune of 1871. Nevertheless, from a study of the causes of its failure, the Hungarian Soviet Republic half a century later can help us to enrich our knowledge of the processes whereby the socialist transformation of society is brought about, in order better to equip ourselves for the struggle for socialism today. In 1919, Hungarian society bore all the hallmarks of an archaic structure which had been maintained more or less intact throughout the centuries. From the bloody reaction which followed the defeat of the Peasant Revolt of 1514 issued the Hungarian law enshrined in Werboczi's Tripartite Code which divided the Hungarian people into fixed castes of great and small nobility, with the clergy on the one side and the "plebs" on the other. For 150 years, Hungary languished under the rule of the Ottoman Turks. Then, in 1687, the Crown of St. Stephen was declared to be hereditary to the male line of the Austrian Habsburgs. For generations, the Hungarians struggled to assert their right to exist as a nation. The most serious attempt to throw off the Austrian yoke came at the time of the revolutionary wave which swept Europe in 1848. But the weak Hungarian bourgeoisie and the spineless nobility proved incapable of freeing Hungary from the foreign oppressor. After the defeat of 1848, the national oppression of Hungary reached its apogee - 10,000 Hungarians were executed. Hungarian newspapers were suppressed and schools taken over by Austrians. Estates confiscated from rebel Hungarians were given to aristocrats from the Viennese court. Thousands of police-spies and agents flooded the country. The Hungarian nation was subjected to the humiliation of Habsburg censorship and Germanification. Then came the rise of Prussia and the humiliating defeat of Austria at the hands of Bismarck in 1866. Smarting under the blow, the Emperor Franz Josef moved towards an understanding with the Hungarian aristocracy. Thus was born the famous "Ausgleich" or compromise of 1867. This deal meant that the Habsburg Empire would henceforth consist of two "ruling people" - the Austrians and the Magyars (Hungarians), two "second-class peoples", the Croats and the Poles, and six peoples without rights: the Czechs, Slovaks, Romanians, Ruthenians, Slovenes and Serbs. The Magyar ruling class supported the Habsburgs and, in return, were given leave to exploit and oppress the other nationalities living in their half of the empire. Hungarian society was characterised by its extreme backwardness, by semi-feudal relationships and the concentration of power in the hands of a small number of wealthy nobles. Some 5% of the population owned 85% of the land. Theoretically, serfdom had been abolished, but in practice, the 20 million acres represented by the great estates were worked by "estate workers" whose social conditions differed very little from that of serfs. These big estates could neither be sold nor divided. An example of the feudal character of Hungarian law was that the Esterhazy family was to always possess 100,000 acres of land which would belong to the eldest son in perpetuity. As an indication of the belatedness of Hungarian social development, the majority of these "entailed estates" were actually created from 1869 onwards - that is, in a period when in most European countries the last traces of feudal land relations were disappearing. Three quarters of the peasantry consisted of poor peasants and farm labourers - a total of 2.5 to 4 million, living in conditions of grinding poverty. It was usual for a peasant to get up at two or three o'clock in the morning at harvest time, and work until nine or ten at night, living on crusts of bread and rancid bacon and sleeping in a hole dug in the field with a hoe. There were no holidays. The average peasant family lived in a one-room hut, often shared by two families or more, sometimes with 20-25 people in one room. Six out of ten babies died before reaching one year. Tuberculosis, brought on by starvation, was so common that it was known as "the Hungarian disease". The one time in his life that the average peasant wore boots was in the army, where he was subjected to racialist abuse and physical violence from the Austrian drill-sergeant. Beating and flogging was also the rule on the estates. According to a "liberal" law, estate servants between the age of 12 and 18 might be beaten by the owner, but only in such a way "as not to cause a wound which does not heal within eight days." A minority of peasants held small plots of land of an acre or so. But these "dwarf-holders" could not maintain their families on the produce of their land and had to hire themselves out also. At the bottom of the scale were the "csiras" or cow-keepers: "The work of the csiras…is the hardest. Generally, after four years, hard work and the heavy manure-atmosphere of the stables destroy the lungs of the csiras. If a csiras is lucky, he gets away before he starts to spit blood. But many stay, become wrecks, and go to the village to live by begging." Land-hunger, along with the national question, was always the motor-force of revolution in Hungary, with a history of bloody peasant revolts put down with the most barbaric cruelty. In the revolution of 1848 there were attempts to distribute the common pastures among the peasants and confiscate the big estates. But the victory of the Habsburgs meant the victory of the big landlords who subsequently formed a solid bulwark of reaction in Hungary, becoming the local agents of Austrian imperialism on Hungarian soil. "The population of the great plain consists of civil servants, rich peasants and the agrarian proletariat, who all live isolated from each other, hating each other. "The civil service regards the Hungarian agricultural districts as colonies, and their own jobs as colonial service. "The rich peasants are somehow lodged in an unassailable and stable conservatism, while the land-workers remember the big historical revolutions and regard the future without hope. Nevertheless, their revolutionary ambitions are still alive." The government bureaucrats who compiled this report were not mistaken. The wave of farm labourers' strikes which swept the country in the earlier years of this century, and which often led to pitched battles with the police, culminated in the strike of 10,000 estate workers in 1905 and the general strike of 100,000 "free labourers" in 1906, which was only broken by calling up the strikers into military service. The only possible escape from this appalling misery was emigration. Between 1891 and 1914 nearly two million Hungarians - 80% of them poor peasants - left the country, crowded like cattle on ships bound for the USA. The social problem in Hungary was exacerbated and complicated by the existence of the national minorities. In 1910, out of 21 million people living in Hungary, there were 10 million Hungarians, 2.5 million Croats and Slovenes, 3 million Rumanians, 2 million Germans, and the rest were made up of Slovaks, Serbs, Ukrainians and other smaller peoples. Thus, for Hungary, the national problem was not confined to the issue of her semi-colonial dependence on Austria, but also included the problem of the national oppression of the non-Magyar elements living within the frontiers of Hungary. The systematic discrimination against the minorities is most clearly demonstrated in the field of education. In 1900, 39% of the total population was illiterate. But the figure for the Slovaks was 49.9%, for the Serbs, 58.5%, Romanians, 79.6% and Ukrainians, 85.1%. Wages in Hungary were 33% lower than in Austria and 50% lower than in Germany. But in 1913 the wages of non-Magyar workers were 30% lower than those of the Hungarian workers. The weak and belated Hungarian bourgeoisie had proved incapable, throughout its entire history, of tackling a single one of these fundamental problems. The reason is not difficult to see. Although undoubtedly the more backward half of the Empire, Hungary had already decisively entered into the process of capitalist development by the turn of the century. Alongside the big feudal estates, modern capitalist industry sprang up, sustained by investments from foreign capitalists. The banks dominated the Hungarian economy and through them was exercised the stranglehold of Austrian, German, French, British and American finance capital. The development of capitalism bound Hungary still closer to the rule of Austro-German imperialism. On the other hand, the feudal aristocracy was also tightly enmeshed with big business and the banks. In 1905 there were 88 counts and 64 barons on the administrative boards of industrial, transport and banking concerns. One of them, Count Istvan Tisza, was chairman of the biggest merchant bank in the country. For all of these reasons, any attempt to destroy the age-old, humiliating dependence on Austria and uproot feudal relationships in the village necessarily presupposed an open fight against capitalism which could only be led by the working class in alliance with the mass of poor peasants and farm labourers. On the eve of the Revolution, Hungary constituted the most backward half of the Austro-Hungarian Empire, but for that very reason, it was that part where social tensions most quickly reached boiling point, and where the ruling class was least able to resist the onrush of social change. The proletariat was a minority of society, predominantly made up of poor peasants. But the oppressive nature of social relations in the villages meant that the peasantry potentially represented a powerful revolutionary ally for the working class. The brutal and degrading treatment of the national minorities throughout Hungarian history also turned out to be the Achilles' heel of the Hungarian ruling class. What was required was a social force capable of galvanising these forces and leading them in the final onslaught against the ruling oligarchy. By virtue of its key role in production, its cohesiveness, organisation and class-consciousness, only the working class, despite its numerical inferiority, was capable of fulfilling this part. The Hungarian proletariat was a later and less powerful class than its Austrian and German brothers. In 1910, only 17% of the population worked in industry, and of these 49% worked in factories of less than 20 workers. But in Budapest and the surrounding area, large-scale industry had sprung up, nurtured by vast infusions of foreign capital. More than 50% of industry was concentrated here. Moreover, the uneven development of industry is illustrated by the fact that 37.8% of the total workforce was concentrated in big factories of more than 500 workers. These giant bastions of labour were to play a decisive role in the events of 1918-1919. 82 giant cartels controlled the whole of Hungarian industry (26 of them Hungarian and 56 Austro-Hungarian). On the eve of World War One, Hungary was in a clear state of semi-colonial dependence on Austria and Germany, forming an agricultural colony which exported food to Austria in exchange for industrial products. The interests of the Hungarian bourgeoisie were inextricably bound up with those of the Austro-Hungarian bureaucratic police state and the feudal landowning oligarchy, whose political expression was the Liberal Party. Behind the tinsel of nationalist phraseology by which the Hungarian bourgeois strove to maintain its base among the masses lay the reality of utter impotence and slavish dependence upon Austro-German imperialism, brutally revealed in August 1914. The Imperialist War threw the whole of society into the melting pot. Enthusiastically supported by the oligarchy and the church, the war against Siberia also received the blessings of the 1848 party, the party of the "liberal" bourgeoisie which had long since discarded its youthful daydreams of national independence to throw in its lot with the imperialist robbers of Vienna and Berlin. At the outset of the war, as in other countries, the working class was paralysed by the first wave of patriotic enthusiasm. The Social Democratic leaders, despite their previous "left" phrases borrowed from the so-called "Austro-Marxists" promptly jumped on the patriotic bandwagon. They justified the war as a war to "defend democracy against Russian barbarism," and even a war "for a shorter working day and higher wages," preaching class collaboration and "class peace". But as the war dragged on, the painful reality came home to the workers and peasants. The "war for a shorter working day" meant that the workers had to toil 60 hours a week. Children of 10 and 12 years of age worked 12 hours a day and more in the factories. Profits soared and wages steadily fell. In 1916, the currency was worth only 51% of its pre-war value, falling steeply thereafter. War disruption caused a terrible collapse of industry. Conditions at the front were worse still. Hundreds of thousands of Hungarian soldiers perished miserably in the cold, snowy winter of 1914-15 in the Carpathian Mountains. Out of an army of nine millions, more than five million were killed, wounded, taken prisoner or missing in action by the end of the war. Of these, two million were Hungarians. Discontent among the Hungarian component of the Austro-Hungarian army led to situations where the Hungarian troops had to be driven into battle sandwiched between German and Austrian soldiers with machine-guns pointed at their backs. Desertion grew to massive proportions as the war drew to a close. Throughout 1915 and 1916 there was a steady increase in the number of strikes. The war-weariness of the masses was aggravated in the case of Hungary by a burning sense of national oppression. The growing ferment in the factories, barracks and workers districts provoked internal dissensions within the ranks of the ruling class. As early as 1915, Count Karolyi founded his pacifist, anti-German Independence Party and tried to establish contact with the Allies, indicating that the more far-sighted representative of the bourgeoisie, sensing the likelihood of a German defeat, were preparing to throw themselves on the mercy of AngloFrench imperialism and climb to power on Allied bayonets instead of German ones. The February Revolution in Russia gave an enormous impetus to the revolutionary movement in Hungary. On the First of May 1917 a massive strike wave and demonstration led to the fall of the reactionary government of Count Tisza, on the 23rd of May. A new government was formed under Count Esterhazy, who attempted to manoeuvre between the classes in an attempt to prevent the situation getting completely out of hand. The government coalition was broadened to include different bourgeois groups, whilst the SDP leaders supported the government from outside. The workers rightly interpreted this move as a sign of weakness and pressed home their advantage. The new government was met by a wave of strikes, which broke out spontaneously, in the teeth of the opposition of the "moderate" trade union leaders. One of these Samu Jasza later admitted that: "Already in 1917 there were many strikes although the trade unions insisted that there should be no interruptions of work." These sorry Labour leaders were compelled to "lead from behind", or lose all influence among the workers. The victory of the October Revolution in Russia had an electrifying effect on Hungary. The masterly anti-war agitation of Trotsky at the Brest-Litovsk Peace negotiations met with a ready response among the mass of war weary workers, peasants and soldiers. The demand for a "peace without annexations and indemnities" was echoed in the factories, in the villages and in the trenches. Under the irresistible pressure of the masses, the anti-war party of the bourgeoisie, led by Karolyi, the "Hungarian Kerensky", found fresh courage to press their demands. The ferment in the factories led to a general strike against the war in Budapest on January 18th 1918, which quickly sparked off mass meetings in which many soldiers participated. The January strike wave swept like wildfire through Austria, Hungary and Germany. It was precisely the hot breath of revolution in the rear which obliged the Austrian representative at Brest-Litovsk, Czernin, to adopt a conciliatory position vis-a-vis the Bolshevik government, although this was overruled by the German General staff, in the person of General Hoffman. For the same reason, the Hungarian government now hastened to extend the right to vote. As always, the ruling class is only prepared to grant serious reforms when it feels itself threatened with the loss of its power and privileges. The bourgeoisie was terrified. So were those right-wing labour leaders who had supported the war and opposed every militant movement of the workers. The Social Democratic leaders, overawed by the rapid extension of the general strike, hastened to call it off on the 21st of January, only four days after it had begun. This betrayal only served to deepen the divisions in the ranks of the SDP and greatly increase the strength of the left-wing opposition. With the collapse of the Bulgarian Front, the wave of desertions turned into a veritable flood which engulfed the country. There were sporadic uprisings and mutinies in the army and navy. Armed bands of deserters linked up with strikers and rebellious peasants in clashes with the police and participated in land seizures. When it became clear that the Central Powers were about to lose the war, these mutinies became general. The state apparatus disintegrated and collapsed under its own weight. The government in Budapest was suspended in mid-air. Power had passed on to the streets. The government fell like a house of cards without firing a shot in its own defence. The streets were taken over by the insurgents shouting slogans such as "Long live independent and democratic Hungary! "…"Down with the counts! "…"No more war! "…"Only the soldiers' council gives the orders!" By the nightfall of October 31st the insurgents had occupied all strategic positions, and freed all the political prisoners. The mass of workers, soldiers and peasants, lacking a revolutionary party and a programme, nevertheless were groping towards such a programme. Perhaps they did not clearly understand what they wanted, but they knew very well what they did not want. They did not want the rule of privileged and corrupt oligarchy; they did not want the monarchy or any substitute for it; they did not want feudal land relations and national oppression. But in fighting for these burning issues, the masses swiftly came to understand the impossibility of partial solutions to their problems and the inevitability of a clean sweep, a total re-constitution of society along new lines in order to eliminate all the accumulated filth of centuries of feudal oppression and national humiliation. The workers demanded a Republic. The bourgeois liberal politicians of the 1848 Party and the right-wing Labour leaders resisted this demand as long as they could. These reluctant "revolutionists" had been taken by the scruff of their neck and pushed into the government by the mass movement. Once in power they dedicated themselves to a stubborn rearguard action in defence of the system of class rule and privilege. Their terror of the masses was a hundred times greater than their aversion for feudal reaction and they clung with all their might to whatever points of support were left to them in their struggle to maintain the status quo. "A friend in need is a friend indeed" holds good in politics as well as in life. Recognising that their whole future as a privileged class lay in the hands of the hated bourgeois liberals and their Social Democratic partners, the bankers, feudal oligarchs, bishops and generals clustered around the "Hungarian Kerensky", hiding behind the shirt-tails of "democracy". On the other hand, the workers and soldiers, as in Russia after February 1917, placed their hope in their own organisations, thrown up in struggle, the Soviets. As in Russia, so in Hungary, there existed the elements of dual power. Unlike Russia, there was no Bolshevik Party capable of steering the pre-revolutionary situation in the direction of a successful socialist revolution. The left wing of the SDP, with its confusion and lack of a clear programme, was incapable of playing an independent role, whilst the right-wing labour leaders were helping Karolyi restore the old class relations under the guise of the "bourgeois-democratic" revolution. Nowadays the "theoreticians" of the CP characterise this as the "bourgeois-democratic" revolution. In reality, the bourgeoisie played no role in the revolution, had no intention of taking power and destroying the old semi-feudal state, and even resisted the institution of a bourgeois republic. The initiative at every stage remained firmly in the hands of the workers and soldiers, who compelled the liberals to take power, in spite of themselves, and began to carry out the tasks of the bourgeois-democratic revolution from below. In other words, what we had here was not the bourgeois-democratic revolution but the abortion of a socialist revolution because of the absence of a genuine revolutionary leadership and the betrayal of the Social Democratic leaders. The bourgeois government of Karolyi, which did not, and could not, carry out any of the fundamental tasks of the bourgeois-democratic revolution in Hungary, proved to be a thousand times weaker, more toothless and impotent than ever the Provisional government had been in Russia after February 1917. On the one hand, the proletariat was the only real organised force in society. Power was in the hands of the workers and soldiers, armed and organised in soviets. On the other hand, the "moderate" leaders of the SDP and the unions blocked their avenue of advance with the false policy of "postponement of the class struggle" for the "defence of democracy", etc. Like the Russian Mensheviks in 1917, and the Stalinists all over the world ever since, the Hungarian Social Democratic leaders appealed to the workers and peasants to set aside the struggle for socialism in the interests of the consolidation of (bourgeois) democracy. They did not see that the tremendous contradictions within society were inevitably giving rise to a polarisation of the classes which would only admit of one of two options: either the working class, at the head of all the oppressed and exploited layers of society, would overthrow the bourgeoisie, suppress the fiction of Karolyi's "National Council" and mercilessly crush the forces of reaction which were sheltering behind it, or else these same forces would take advantage of the situation to recover their strength, regroup and launch a new counter-offensive which would cast aside the velvet glove of "democracy" to reveal the mailed fist of fascist reaction. There was no "middle road". Either the workers would triumph and establish a workers' democracy, or the ruling class would take a terrible revenge on the working class and poor peasantry. There was no other way, yet the "middle roaders" seemed firmly in the saddle. Karolyi enjoyed a certain popularity, especially with the petit-bourgeois masses, as a result of his opposition to the war. The SDP, in the initial period, grew by leaps and bounds. The masses, newly awakened to political life, streamed into the labour organisations, oblivious of the role being played by the leadership. Not only workers, but many intellectuals, professional people, even policemen and civil servants joined the SDP, some for honest reasons, others as an "insurance policy" with an eye to the future. Suddenly, Social Democrats and Republicans, hitherto persecuted as dangerous radicals, became pillars of respectability, and saviours of society. Now that the cause of the monarchy was irretrievably lost, all the reactionary elements of society gathered round the banner of the bourgeois republic, staunchly upheld by Karolyi and the Social Democrats. However, the masses were not slow to grasp the enormous gulf which now opened up between the sort of republic which they wanted and the sort of republic they had got. Emboldened with success, the workers took to the streets to press their class demands, despite their leaders' frantic appeals for calm. On the 16th of November a giant demonstration of hundreds of thousands gathered outside the Parliament building to demand a socialist republic. They had not overthrown the 400 year-old Habsburg Empire merely to hand power back to the old masters under new names. The soldiers streamed into Budapest from the front. They tore off the insignia from the officers' shoulders. The streets of the capital were full of mutinous troops: 300,000 of them, waiting to be demobbed. Officers and bourgeois were attacked on the streets. The government of Karolyi was a government in name only. It had no reliable army to rest on. Arms were in the hands of the workers. The economy had virtually collapsed. Hungary was blockaded by the Allies. The food situation was critical. In an attempt to pacify the masses, the Karolyi government drew up a land reform programme aimed at distributing to the land workers estates exceeding 500 acres with compensation to be paid by the government. Karolyi, himself a landowner, gave his estate to the peasantry. But his example was not followed by the rest of his class. Like all the other measures of this government, the land reform remained on paper. As on the land question, so on the issue of the oppressed nationalities, Hungarian bourgeois democracy had arrived with its hands empty. As Karolyi himself later complained: "The situation had now radically changed, and what might have appeared to us an extremely liberal offer had become entirely anachronistic. The minorities of yesterday justly regarded themselves as the victors of tomorrow, and refused to envisage any solution within the framework of the Crown of St. Stephen, the very name of which was an offence to them." "Too little and too late" would be a fitting epitaph for the ill-fated bourgeois democracy in Hungary, which came to power when history had already placed on the order of the day the proletarian revolution as the only way of solving the problems the bourgeoisie was incapable of tackling. To the growing discontent within the country was now added a new and menacing threat from without. During World War One the national bourgeoisies of Eastern and Central Europe - that of Hungary included - had enlisted under the banner of German imperialism, but with the defeat of Germany and the disintegration of Austro-Hungary, the ruling classes of a welter of small newly-formed states vied with each other for the favours of Anglo-French-American imperialism, while simultaneously warring against each other to see who could grab most territory from its neighbours. The "Wilson Doctrine" of US imperialism which paid lip-service to democracy and the right of self-determination for small nations served as a convenient pretext for a series of predatory little wars which in turn served to balkanise Central and Eastern Europe and bind the newly-formed states even more firmly to the chariot of victorious Anglo-French and US imperialism through the agency of the banks, railways and giant trusts. The slogan of the Socialist United States of Europe, launched by the newly-formed Communist International, represented the only hope for the peoples of Europe, divided up and bled white by wars, famine and economic collapse. Only the success of the socialist revolution could offer a way out of the blind alley in which the small and backward states of Europe found themselves. The ruling class of Hungary attempted to shield itself from the storm hiding behind the forms of parliamentary democracy. But the social convulsions set in motion by the war did not admit of half-way solutions. Far more quickly even than the Provisional government in Russia, the Karolyi government revealed its bankruptcy, and in a far more striking manner. The immediate cause of the fall of the government was the ultimatum of March 20th, 1919 presented on behalf of the Allies to the Karolyi regime demanding that Hungary should accept a new line of demarcation. At the time of the Armistice, some months earlier, Hungary had already accepted a humiliating loss of territory. Now the Allied robbers assembled at Paris demanded the handing over of lands occupied by a further two million Hungarians. The helpless Karolyi government tried to stall, suggesting a referendum, which was peremptorily refused. The Allies demanded an answer the same day. Undermined by pressure within and without, and realising his own impotence, Karolyi refused to take responsibility for the affairs of the nation and resigned. By so doing the whole of Hungarian bourgeoisie admitted its total incapacity to lead the nation at a decisive moment. The following day, March 21st, the Soviet Republic was proclaimed. The proletariat had come to power without firing a shot. The sudden fall of Karolyi meant a sudden and sharp turn in the situation of the Hungarian Communist Party which after only four months of existence found themselves suddenly confronted with the problem of power. The leaders of this party were young and completely inexperienced. Their views, like those of many of the newly-formed Communist Parties, were coloured by a mixture of youthful ultra-leftism and syndicalism. Their impatience led them to overlook the dynamics of the revolutionary process and the complicated interrelation between the class, the party and its leadership. In many ways this was understandable. The Russian Bolshevik Party had taken shape over decades. It had behind it the experiences of the 1905 revolution and of work under the most varied situations. But the new parties of the Communist International in most cases were made up of young, raw and untested recruits who had moved over to Bolshevism in the stormy period opened up by the October Revolution. They had not had time to get their bearings and acquire the necessary experience and authority in the eyes of the masses when they were plunged into the turbulent revolutionary movement of 1918-1920. Nowhere was the transition so abrupt as in Hungary. The young CP leaders, mostly made up of ex-POWs recently returned from Russia, showed courage, initiative and energy. But from the beginning, their confusion on questions of theory led them to make a serious of mistakes on fundamental issues which would later have disastrous consequences. On the very key question of land they advocated the confiscation of the big estates, but were opposed to the distribution of land to the peasants on the grounds that this would favour the development of small proprietors and hinder the growth of socialist ideas in the villages. On the national question, instead of clearly coming down in favour of self-determination, they advanced the essentially meaningless slogan of "proletarian self-development." Nonetheless, in the prevailing revolutionary climate, the Communists gained ground rapidly, in spite of their mistakes, penetrating the barracks, factories and trade unions, hitherto dominated by the right-wing labour leaders. Given the mood of the masses, the CP experienced an explosive growth in a question of weeks, not only in proletarian Budapest, but in Szeged, the second largest city, where a big section of the SDP went over and many of the local garrison openly displayed Party cards. Most importantly, the Youth League of the SDP went over en bloc to the CP in December 1918. Alarmed at the rapid growth of the CP which threatened to undermine their increasingly tenuous hold on organised labour, the Social Democratic leaders started a scare campaign against the "Russian" Bolsheviks and "splitters" and "counter-revolution from the left". Like the Russian Mensheviks, the Hungarian SDP leaders did not consider Hungary "ripe" for a socialist revolution. They based themselves on the idea of a lengthy evolutionary process in which, peacefully, gradually, without sudden upheavals, Hungary would pass, firstly through a long period of bourgeois democracy and then, perhaps after 50 or 100 years, Hungarian society would be "ready" for socialism. Unfortunately for the ideologies of gradualism, the current of events was moving swiftly in the opposite direction. Seeing the failure of the bourgeois democracy to deal with any of their pressing problems, the masses took to direct action. There was a wave of factory occupations. Workers' control was established in many centres. There were constant street demonstrations of workers, soldiers and unemployed. At the end of January 1919 there were bloody clashes between government soldiers and strikers. Discontent spread to the army. The national question surged up and renewed intensity with revolutionary upheavals in the Western Ukraine. Karolyi's promises of autonomy, far from damping down the movement added fuel to the flames. Following the example of Noske and Scheidemann in Germany where in January Rosa Luxemburg and Karl Liebknecht had been murdered at the instigation of the Social Democratic leaders, the SDP leadership whipped up an anti-Communist campaign which culminated in a provocation similar to the July Days in Russia, and the arrest of the leadership of the CP. Bela Kun and his comrades were subjected to savage beatings in prison. However, the government had miscalculated. In a revolutionary situation the moods of the masses can change rapidly. The arrest served to cast a spotlight on the counter-revolutionary role of the SDP leaders in the government. The raw masses who had looked towards the SDP leaders in the hope of finding a solution to their problems, now turned swiftly against them. The CP, from being a small minority, now gained the majority support in the key areas of the workers' movement. The workers drew a simple conclusion: if this government is against Bolshevism, we must be for it. SDP leaders now found themselves shouted down at public meetings. Even right-wing Social Democrats, like Erno Garami later admitted that "the arrest of the Bolshevik leaders not only did not weaken, but strengthened their fighting capacity." Another of the same stripe, Wilhelm Bohm wrote: "Deprived of their leaders, the Bolshevik movement gained new strength." The movement was now flowing strongly in the direction of the CP. The arrests served as a catalyst for all the accumulated discontent and frustration of the masses. Throughout the month of March, there was an unmistakable tendency towards armed insurrection. In Szeged on March 10 the local soviet took control rapidly followed by other towns. Peasants seized the lands of Count Esterhazy, without waiting for government decrees. Caught off balance by the unexpected turn of events, the reformist labour leaders tried to deflect the movement along harmless channels by advancing the slogan of a constituent assembly. But the SDP leaders were being left high and dry by the impetuous movement of the masses. The heavy battalions of labour in the big factories of Budapest declared for the CP. The workers were drawing revolutionary conclusions from the whole situation. They had overthrown 400 years of Habsburg rule by their own strength and organisation. The workers' soviets possessed not only small-arms but machine guns and artillery. On the other hand, the government had no armed forces it could depend on to fight its battles for it. The masses had been through the harsh school of war, revolution, and counter-revolution with a democratic mask, and were now prepared for a decisive show-down. The moderating arguments of the SDP leaders now cut no ice. The workers interpreted them correctly as attempts to divert their attention from the central goal of power. The growing impatience of the workers with the role of the Social-Democratic leaders was expressed in the refusal of Budapest printing workers to print the SDP newspaper Nepszava. The printers struck on March 20 - the same day the Allies sent their ultimatum to Karolyi. On the 21st the printers' strike had turned into a general strike, demanding the release of the CP leaders and the transfer of power to the working class. Demoralised, the bourgeois liberals handed over power to the reformist labour leaders, who accepted the gift with heavy heart and trembling hands. The bourgeois put all the onus of resolving the crisis on the shoulders of the Social Democratic "moderates". But the latter, always willing to accept their "patriotic duty", were in a singularly weak position. Their influence among the masses was fast dwindling to nothing. How could they maintain themselves? There followed an event without precedent in history: the SDP leaders, still in the government, went to the prisons to negotiate with the CP leaders, imprisoned with their connivance, shortly before. This fact in itself, demonstrates the major changes in the correlation of class forces which take place in a revolutionary situation. At first the SDP leaders asked the CP to support them from outside the government. When this was refused, the reformists actually proposed a merger of the parties! What this offer amounted to was a proposal to form a coalition government under the disguise of a "united" Socialist Party. The wily old foxes who ran the SDP were prepared to sign anything, agree to anything, no matter how radical-sounding, in order to get agreement. The life-long exponents of gradualism were suddenly converted to the dictatorship of the proletariat, soviet power, revolution - anything at all - to get the Communists to participate in government with them. In point of fact, the Social Democrats were merely recognising the reality of the situation. For while the CP leaders were negotiating for unity with them, the workers of Budapest were carrying out a bloodless revolution, to which the government could offer no resistance. The CP and SDP were united as a movement when power was effectively already in the hands of the armed working class. In carrying through this unification, the CP leaders committed a major blunder for which the working class would pay dearly later on. While Bela Kun, the leader of the Hungarian Communists, lulled the workers with glowing accounts of unity as the "precondition for workers' power", many rank and file Communists were confused by the move and opposed to it. In trying to find an "easy" solution to the problem of building the Party and a "short-cut" to power, Bela Kun fell into a trap. Lacking confidence in themselves, in their programme and policy and in the working class, the CP leaders brought about a fusion with the Social Democrats in the worst imaginable way. This was a bureaucratic fusion at the top, instead of a genuine unification on the basis of patient work to win over the workers from their old leaders. Yet at the time of unification, the influence of the Communists among the decisive sections of the proletariat was far greater than that of the reformists, who were heavily compromised by their collaboration in government with the bourgeoisie and their repressive actions against the workers. They only hit on the idea of fusion when their own fortunes were at an all-time low and the revolution was already a fact. Their idea was to preserve their prestige and privileges by throwing in their lot with the winning side. Only the most openly counter-revolutionary elements, led by Erno Garami, refused to participate in the unification. Among those who did there were both honest left-wingers and hardened right-wing bureaucrats. "Please inform us what real guarantees you have that the new Hungarian government will really be Communist, and not just simply socialist, that is, a government of the social traitors? Do the Communists have a majority in the government? When will the congress of soviets take place? In what does the recognition by the socialists of the dictatorship of the proletariat really consist of? Lenin's advice to the Hungarian Communists had nothing in common with sterile sectarian intransigence. In fact, Lenin himself defended the idea of unification, provided it was properly carried out, on a clear-cut revolutionary programme and excluding all the old right-wing leaders. The error was not in seeking unification with the Social Democrats, but in mixing up the banners and programmes in a light-minded fashion. The Hungarian Communists, in reality, liquidated their Party into the SDP, whose leaders were given the lion's share of the leading positions in the Party, the unions and the government. By the action of Bela Kun and the others, the most advanced and revolutionary elements of the class were submerged in the more politically backward and inchoate masses. The mistake proved to be a fatal one. It shows exactly what would have happened in Russia, had the Bolsheviks fused with the Mensheviks after the February revolution, as advocated by Stalin and Kamenev, or succumbed in November 1917 to the pressures to form a coalition "government of all soviet parties", successfully resisted by Lenin and Trotsky. It is law of revolution that in the decisive moment when the question of power is posed, the leadership of the revolutionary party inevitably tends to come under the pressure of alien class influences, the pressure of bourgeois "public opinion" and even of backward layers of the working class itself. The Bolshevik leaders in Petrograd in February 1917 were far more experienced than the Hungarian Communist leaders in March 1919, yet Kamenev and Stalin, under enormous pressures, took the line of least resistance, advocating support for the Provisional Government and unity with the Mensheviks. The fear of being "isolated", of appearing in the eyes of the masses as "splitters" and "sectarians" acts as a powerful pressure weighing on the shoulders of the revolutionary leadership. Only a clear overall view of the revolutionary process, could have provided sound policies for resisting these pressures. The young and inexperienced leaders of the Hungarian Communists lacked the necessary political insight and firmness, vacillated, and lost their heads. Had they preserved an independent identity, followed Lenin's advice of offering a working alliance with the SDP and worked patiently to convince the Social Democratic workers of the correctness of their ideas and programme, they would have swiftly won over the great majority of the workers as well as the honest elements among the leaders, isolating and excluding the corrupt careerists. It was the desire to find a "short cut" which effectively prevented the CP from doing this. The new workers' government in Hungary had a series of important advantages. The revolution, contrary to all the arguments always advanced by the reformists about violence, was entirely bloodless. The bourgeoisie was too demoralised and shaken to offer resistance. The mass of the population undoubtedly identified with the new government, not only the workers and poor peasants but also, unlike in Russia, a big section of the intelligentsia which, partly because of the old national-revolutionary traditions, supported the revolution. On the other hand, the Hungarian Workers' Republic was born at a critical moment in the life of world imperialism. The very foundation of the system appeared to be collapsing under the hammer-blows of the revolution. 1919 was a fateful year in the history of mankind. After the revolutionary upheavals in Berlin in January, Austria entered into a stage of revolutionary ferment. A short-lived soviet republic was proclaimed in Bavaria. In France, the period of demobilisation was accompanied by extreme tension. In Britain, the shop stewards' movement and the Triple Alliance were at their height. There was the struggle for the 40 hour week and the "Hands Off Russia" movement, mutinies in the army and the revolt on the Clyde. As the year wore on there were big strike movements in Holland, Norway, Sweden, Yugoslavia, Romania, Czechoslovakia, Poland, Italy and even the USA. With a correct policy and orientation, the Hungarian revolution could have carried the flames of revolt into the heart of Europe, as the strategists of imperialism recognised only too well. Tragically, the leaders of the Hungarian Communists committed a series of errors which effectively sealed the fate of the revolution. As already pointed out, the party had a completely erroneous position on the land question. This was now carried into practice. Of the nine million inhabitants of the Hungarian soviet republic, 4.4 million worked on the land. There were 5,000 big landowners (1% of the total), who owned more land than the remaining 99%. There were a million "rural proletarians"; about 700,000 small peasant families; more than 100,000 middle peasant homesteads (11.7% of the total) and about 70,000 kulak households (8% of the total). A correct agrarian policy could and should have won over the great majority of peasants to the side of the revolution. In Russia, the decree on land was one of the first decrees issued by the Bolsheviks immediately after taking power. In Hungary it took the new government two weeks to publish the land decree - a long time in a revolutionary situation, which gave the counter-revolutionary elements in the villages a golden opportunity to spread alarmist rumours and anti-socialist propaganda. Worse still, the ultra-left impatience of the Hungarian Communists led to an abortion of the agrarian reform. Bela Kun and his companions looked on the peasant question in a narrow "economic" sense. They had not understood the dialectical nature of the relationship between the proletariat and the peasantry and looked askance at the Russian Bolsheviks' policy of distributing land to the peasants, which in the short term reinforced the development of small property-owning elements in the villages, but which succeeded in galvanising the mass of poor peasants around the banner of the socialist revolution. "Tibor [Szamuely] and I," wrote Bela Kun after the defeat of the revolution, "believed that our agrarian policy was cleverer than that of the Russian Bolsheviks, because we did not divide up the big estates among the peasants but set up socialist production on them, basing ourselves on the rural workers and not turning them into enemies of the proletariat, thanks to the fact that we did not convert them into owners, landed proprietors." Laszlo Rudas pointed out that the poor and middle class peasant was "in the best of cases indifferent to the fate of the dictatorship of the proletariat." This observation, however, is only relatively true. Why were the Russian poor and middle peasants not indifferent to the fate of the Russian workers' state? Because the Russian Bolsheviks had distributed the land to the peasants, they knew that, in defending the workers' state they were defending their plots of land against the big land-owners who supported the White armies. "Socialist consciousness" did not enter into it. Yet the Bolsheviks, led by Lenin and Trotsky, made skilful use of the land question to win over the multi-millioned peasant masses to the side of the socialist revolution. Far from making enemies of the peasants, the Bolshevik agrarian policy turned them into enthusiastic defenders of the revolution. Without this alliance, the Bolsheviks would not have survived longer than the Hungarian soviet republic did. In practice, these conservative bureaucrats were by nature terrified of any kind of initiative of the masses. To these elements, the idea advanced by Marx and Engels, and put into practice by the Bolsheviks, of a "second edition of the Peasants' War" as an auxiliary arm of the proletarian revolution, was anathema. Hiding behind the CP leaders they lent their support to collectivisation, not out of any revolutionary enthusiasm, but as a possible means of avoiding "disorder" in the villages. They carried out the agrarian reform by the most thoroughly bureaucratic means, depriving it of any revolutionary content and appeal it might have had. In their heart of hearts, the Social Democrats opposed the confiscation of the land - in later years Count Karolyi himself revealed that the idea of agrarian reform had been opposed not only by the landowners and the Church, but also by the SDP leaders. The result was an abortion. "Commissars for Production" were put in charge of the collective farms. In many cases this was none other than the former landowner. He lived in his old house, and the peasant continued to address him as "master". How could such a situation strike a responsive chord in the hearts of the poor peasants and farm labourers? As far as they could see, nothing fundamental had changed from before. This explains the indifference of the poor and middle peasants "in the best of cases" to the revolution. The village poor were unconvinced by the new situation, which closely resembled what existed previously, though the names had changed. The small proprietors were suspicious of the government's intentions and easily influenced by the propaganda of the rich peasants and landowners that the government wished to nationalise their land also. Whereas Lenin's policy had succeeded in driving a wedge between the small peasants and the kulaks, Bela Kun's "cleverer" policy only succeeded in uniting the small peasants and the kulaks in a hostile bloc, opposed to the revolution. The failure of the agrarian policy had serious results in other fields. The government, conscious of the hostility or indifference of the majority of peasants, did not feel sufficiently confident to requisition grain, as the Bolsheviks had done in Russia. This led to serious difficulties in supplying the towns and the Red Army with food and clothing in the critical months which followed. The mistake was a fundamental one. In the ensuing months, the government, instead of concentrating all its efforts in widening its base of support and waging a merciless struggle against the counter-revolutionaries, frittered away its energies on all sorts of secondary questions. Under Lenin's insistent pressure the eight-hour day was introduced together with a number of worthwhile practical reforms to raise the living standards of the people. The Hungarian soviet republic, which had conquered power with such ease, now found itself in a weak position to resist the onslaught of reaction. The government itself was made up of 13 members, of which only four were Communists. They imitated all the external forms of the Russian Revolution (something Lenin had warned them against doing) including the creation of a peasants inspectorate, and even made Lenin "Honorary President" of the Budapest soviet! On the other hand, the Red Army, established by decree on March 30th was really the old army under a new name, placed under the control of the Social Democrat Pogany and staffed by officers of the former regime. Most of the commissars attached to the army were Social Democrats, including the commissar-in-chief, Moor. The Red Militia included whole detachments taken over lock stock and barrel from the old police and gendarmerie. In this way, instead of completely destroying the old state apparatus, important elements of it were preserved under the new labels. Only gradually were the army and militias purged of the old reactionary elements. In the meantime, priceless time was being lost in the fight against reaction. In 133 days of its existence, the soviet republic issued no fewer than 531 decrees. If revolutions were won and lost on the strength of paperwork, the Hungarian workers would never have lost. Unfortunately for Bela Kun, the reaction fought with real bullets, not paper ones. On the economic front also, the impatience of the CP leaders led to enormous problems. After the October revolution the Bolsheviks had only nationalised the banks and big industries. This was sufficient to concentrate all the fundamental levers of the economy into the hands of the workers' state and the more complicated task of integrating small and medium-sized enterprises into the nationalised sector could proceed at a slower, more orderly pace. However, the desire of Bela Kun to "go one better" than the Bolsheviks, caused the Hungarian workers' state to nationalise, without compensation, all businesses with more than 50 employees five days after coming to power. This was trying to do too much, too soon, in a backward country where large-scale industry still represented a relatively small sector. In fact, within one month, no fewer than 27,000 businesses were nationalised - many of them with less than twenty workers. It is true that the initiative for these nationalisations usually came from the workers themselves. The government was swamped with demands from workers asking to be taken over. Even the wig-makers wanted to be nationalised. But the idea of the Hungarian CP leaders of introducing "socialism now" without taking due care and consideration for the problem of the transition between capitalism and socialism caused serious difficulties. Without adequate preparation and sufficiently developed technology, the nationalisation of thousands of tiny businesses was suicidal and brought about considerable economic dislocation. Measures such as the decree requisitioning all cabs in Budapest and other towns regardless of the number of employees concerned antagonised important sections of the middle class, small producers and artisans. The errors committed by the Hungarian Communists seriously weakened the revolution in the face of the growing threat from the forces of reaction. The imperialist powers, gathered at the Paris Peace Conference, understood only too well the danger posed by the "Hungarian question". The possibility of armed intervention was raised. But the underlying weakness of imperialism at that moment is revealed by their inability to intervene directly against the Hungarian revolution. Instead the British, French and US imperialists were obliged to rely on the services of the Czech, Romanian and French bourgeoisies to do the dirty work for them. On April 16th the Romanians launched their attack, which immediately showed up the weakness and unpreparedness of the Hungarian soviet republic. The "Red Army", made up of troops and officers of the old regime crumbled before the offensive, a number of sections going over to the enemy. 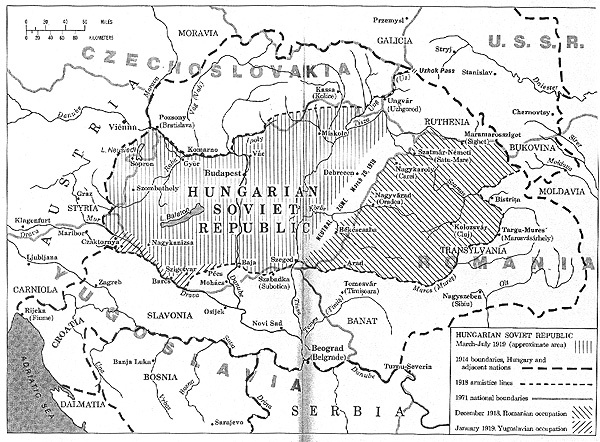 The Romanian army penetrated deep into Hungarian territory without meeting serious resistance. To add to the danger, the Serbs, egged on by the Allies, invaded southern Hungary, while the "democratic" Czech bourgeois also joined in, attacking in the West with troops commanded by French and Italian officers. The Times of May 7th 1919, voicing the aims of the imperialists demanded the surrender of Hungary, the disarming of the Red Army, and the resignation of the government and the occupation of the country by Allied troops. At the first sign of danger, the Social Democrats in the government wanted to throw in the sponge. Wilhelm Bohm, one of the principal SDP leaders, and former head of the Red Army, drew up a plan of capitulation. The demoralising activities of these right-wing labour leaders served to paralyse the government at a decisive moment. Undoubtedly, had matters been left in their hands, Budapest would have been occupied by the Whites without resistance. However, the heroic proletarians of Budapest once again took matters into their own hands, forcing the government to change course. In a whole series of mass meetings, the workers ignored the pleas of Bohm and Co. and voted to fight. Levies were raised in all the big factories and flying columns were sent from the workers' districts to the Front. In a few days, thanks to the magnificent initiative of the workers, thousands of volunteers joined the Red Army - factory workers, railwaymen, clerks, postmen, office-boys, who transformed the whole situation in 24 hours. The Red Army was reorganised on a new basis. And on March 2nd the Budapest workers succeeded in pushing back the invading forces all along the line. In a brilliant seven day campaign, the proletarian Red Army passed over from the defensive to the offensive, recapturing many towns and villages from the enemy, against overwhelming odds. The Czech army was thrown into a panic by the offensive. Large areas of Slovakia were liberated, and on June 16th, a Slovak soviet republic was proclaimed. However, the heroic exertions of the Hungarian workers were being constantly undermined by the SDP leaders in the government, who now began a systematic campaign of criticism against alleged "harsh methods" and "needless cruelty". In point of fact, no-one could accuse the Hungarian workers of excessive cruelty. Rather the reverse was true. The revolution had been far too indulgent with its enemies, and was now paying a terrible price. To demand the renunciation of "harsh measures" in the middle of a terrible and bloody civil war was tantamount to demanding surrender to the enemy. Even the most democratic parliamentary bourgeois government will not tolerate defeatist propaganda in time of war. Yet the Hungarian workers had to put up a fight on two fronts: against the open class enemy at the Front and the disguised and hypocritical agents of the enemy striving to undermine the war efforts from key positions in the government itself. Too late, the CP leaders realised the mistake of unification. Bela Kun grumbled about the Social Democrats and hinted at the need for a split at the very moment when the firmest unity and decisiveness of leadership was needed to fight the war. The government was riven with divisions. The SDPers formed a majority of all leading bodies of the "united" party, with very few exceptions. They controlled its "Revolutionary Governing Council". These consummate careerists, who had supported the "dictatorship of the proletariat" to save their positions, now made up their minds not to back the losing horse, and were busily "mending fences" with the other side. They were seeking to put as much ground as possible between themselves and the "Bolsheviks" whom they were determined to blame for the whole affair, and to refurbish their credentials as respectable "democratic" bourgeois politicians who had really meant no harm and had merely participated in the revolution in order to "avoid excesses" and ensure the whole thing did not get completely out of hand. If matters did not come to a split, that was because the CP leaders, despite pressure from the Communist International to come out openly against the SDP leaders, wavered and backed down under pressure. The activities of the SDP in the government provided the green light for imperialism. On the initiative of the "people's champion", President Wilson, the Paris Peace Conference, now thoroughly alarmed at the successes of the Red Army, sent a further ultimatum to Budapest on June 8th, demanding a halt to the Red Army's advances and inviting the Hungarian government to Paris to "discuss Hungary's frontiers." The note was followed by a second ultimatum, threatening the use of force if these terms were not accepted. This new ultimatum was seized on by Bohm and Co. to launch a new campaign for "peace at any price." Under pressure, Bela Kun again temporised and advocated a truce. On June 18th, Lenin sent a telegram in which he explained that, while negotiations with the Allies was, in and of itself, a correct tactic to gain a breathing space, no trust whatsoever should be placed in the Allies and their offers of peace. In reality, there was not the slightest guarantee that the Allies' promises would be kept, were the ultimatum to be accepted. With foreign armies still on its soil, the revolution was being asked to disarm itself on the strength of a scrap of paper. Yet on June 26th, negotiations were started, and the Red Army began to withdraw. "We did not answer the manoeuvres of Clemenceau with counter-manoeuvres. We had not striven to gain time by spinning out the negotiations. We didn't even try to compel them to accept such negotiations, but merely carried out all that they demanded, without the slightest guarantee, without taking into account the possibility of the disintegration of the army in the event of a retreat." The fate of the Hungarian .evolution was now sealed. On June 24th, there was an attempted counter-revolutionary uprising in Budapest led by self-styled "National Social Democrats", which was put down in 24 hours. On 20th July, Clemenceau issued a further note, stating that the Hungarian government was "not competent to negotiate" and demanding the formation of a new government excluding the CP and composed of "responsible labour leaders." The SDP leaders eagerly accepted the demand, as was to be expected. They had shielded themselves behind the CP, but now the pendulum had swung the other way and Bela Kun and Co. had outlived their usefulness. Here again, the CP leaders displayed extreme naively and confusion. Instead of conducting a fight to expose the manoeuvres of the SDP leaders (who, incidentally, were directly in contact with the French, British, Italian and the US military mission in Budapest), they eventually agreed to resign "to prevent useless bloodshed." The coup d'etat had been accomplished without firing a shot. The "responsible" labour leaders concentrated all power in their hands with a view to handing it back as quickly as possible to the landlords and capitalists. With this episode, the slide towards the counter-revolution assumed an irreversible character. The new Social Democratic government hastened to undo all the measures carried out by the revolution. Nationalised firms were handed back to their former owners. The gains of the workers and peasants were wiped out. Many CP members were arrested, while counter-revolutionary elements were released from the prisons. In their reformist blindness, the right-wing labour leaders imagined that these actions would endear them to the Whites and enable them to make their peace with triumphant reaction. Vain illusion! On the 6th of August, the new government was itself overthrown by a handful of military adventurers. Disoriented and leaderless, the heroic proletariat of Budapest was helpless to offer resistance. With the entry of the Rumanian army into Budapest, a reign of terror began against the Hungarian working class. The landlords and capitalists took their revenge for the fright they had experienced. with no vacillations or qualms of conscience about "ruthless acts of cruelty." Wounded Red Army soldiers were dragged from the hospitals and murdered. The Whites used the most barbarous, medieval methods of torture, 5,000 people lost their lives in this period. And the Pontius Pilates of "gradualism", those reformist labour leaders who had protested loudly at the alleged "excesses" of the workers and peasants now looked the other way, justifying murder and repression in the most cowardly way in return for the retention of their jobs and privileges. "In the Romanian and Czech armies there is a noticeable slackening of discipline, and Bolshevik ideas are spreading in their midst, which is indicated by the fact that in Bessarablia the workers' and peasants' movement has turned against Romanian rule." Some 8,000 Czech soldiers also refused to fight and deserted en masse through the Carpathians to Galitsia where they were interned by the Poles. There were also cases of fraternisation on the Yugoslav Front. All of which shows what would have been possible if the Hungarian Communists had pursued correct policies in the revolution. Today, 60 years later, despite all the mistakes, the brief experience of the Hungarian soviet republic is a source of inspiration for all thinking workers and socialists. Only by analysing the mistakes of the past will it be possible to educate the present generation and prepare it for the tasks which the coming period will once again place before the labour movement in Britain and internationally. The Magyar name of the film is "Csillagosok, katonák". Why does everybody blame Romanian intervention for the defeat of the Hungarian Soviet Republic.Bela Kun promised the people of Hungary he would restore the old boundaries of the Hungarian Kingdom, and that is mainly why the Revolution in Hungary happened.The people were seduced by Kun's irredentist rhethoric and their aim was to conquer not to estabilish communism.The Romanian State reacted just as the Hungarian or the Russian would have at that time. You see...there is a great problem with bolshevik-communism,its being an authoritarian ideology implies that it often relies on nationalism and patriarchal traditions .Bela Kun's movement was as nationalist as Hitler's . Oh...accept this opinion from one who is Romanian not by choice,but by an accident of thermodynamics. Hello Comrades, International Marxist Tendency member here. I appreciate that you are sharing this article even with reservations, as I think it sheds light on a relatively unknown piece of working class history. Might I ask for some analysis of what you think comrade Woods' errors in analysis are? An alternative perspective would do more to broaden the debate then a mere disclaimer. It would also be nice if you could link to the original article in case people are interested in other works by the author or our organization.